The UTM team is working to facilitate learning for students in numerous schools across Malaysia. The team, which was fully funded by its industry partner, has successfully established its 5th STREAM Fun Learning Toy Library in Johor. The school chosen was SMK LKTP Ayer Hitam, Kluang. In September 2018, students from Year 5 and 6 were given the privilege of having a toy library in each of their classrooms. The team conducted their initial school visit in March 2018 for a feasibility study. The effectiveness of the STREAM Fun Learning Toy Library program and its impact on the Felda Ayer Hitam community were closely monitored. On 12 March 2019, the “Adopt a Kampung” team, headed by the Research Chair, visited the school to monitor and collect data to study the outcome of the project. This trip was part of the efforts taken by the team to ensure that the team’s community work and its industry partner investment yield positive outcomes to the targeted community. 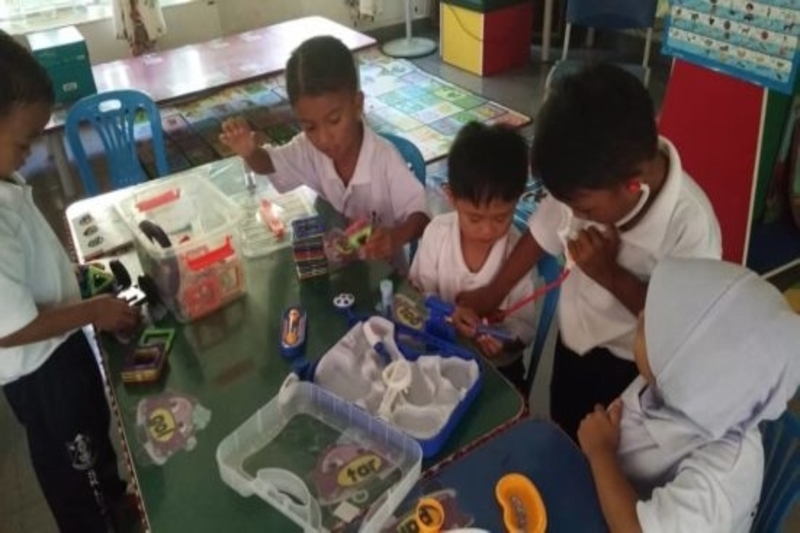 Similar projects carried out previously in Kelantan schools had so far revealed that the toy library projects have had a high impact on the community of the rural and remote areas. The team’s effort was highly recognized, their projects receiving a 5-star rating for two consecutive years, besides securing a silver medal in the NALI 2018 poster competition. Being the first of its kind, STREAM Fun Learning Toy Library has unique features that have also attracted the attention of several NGOs, private companies including The Institution of Engineers Malaysia, Academy Sains Malaysia, the former Education Minister, and Kelantan and Johor Education Departments. More recently, the National Library of Malaysia has also expressed interest. The teamwork is also relevant when their effort addresses the STEM education global issues as it inculcates STEM interest in children at a very young age. Positive feedback from the teachers, parents, students of the pre-school classes who are currently in Primary 1 in the year 2019 is very encouraging. As this is an ongoing project, the team will continue to collect and analyse all related data for publication purposes in the future. In addition, a comparative study on the STREAM Fun Learning Toy Library will also be conducted between the schools in Kelantan and Johor. In the previous year, 2018, a paper-based seminar on this program was presented at an international conference for Women in Science and Technology (WiSET 2018) at KL Convention Centre. The article has been published in IOP Journal this year. Malaysia’s Education Blueprint highlights the importance and necessity of STEM education. The Malaysian Government aims to prepare students with the skills they need to meet the science and technology challenges and to ensure that Malaysia has a sufficient number of qualified STEM graduates. Under the STEM initiative, the Government is working to raise student interests through new learning approaches and an enhanced curriculum, sharpen skills and abilities of teachers as well as build public and student awareness. The New Primary and Secondary Curricula prioritises the need to develop in students higher order thinking skills, project-based learning, ICT games-based learning and minimising content overlap with other subjects & postsecondary. Thus, it is clear that the Government and members of academic institutions are working to help develop the IT talent needed in Malaysia for it to keep pace with the world and meet Industry 4.0 workforce needs.